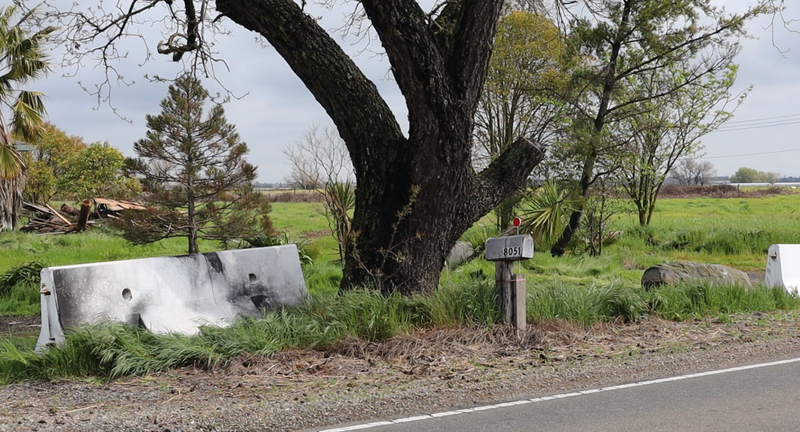 In the follow-up to a story posted earlier this week, the City of Elk Grove took steps to address a dumping spot on city-owned property. The dump site is located at 8051 Kammerer Road on the city's far southern border. A video posted showed the parcel has been used as an illegal dumping site. After contacting the city, Elk Grove public works director Robert Murdoch committed to cleaning out the debris and restricting access to the area by yesterday. Crews were seen on site yesterday and as of the morning of Saturday, March 23, work had been performed. While much of the recently dumped rubbish was removed, and access somewhat restricted, it would appear further duties need to be performed. Specifically, as it relates to access. To restrict access, six cement barriers were installed. While the barriers will make dumping somewhat less convenient, it is not expected to eliminate the practice. Illegal dumpers can still park on the shoulder, and simply throw unwanted material over the barriers. Additionally, while it is muddy, there is a dirt driveway on the western edge of the parcel that connects to the road giving easy access around the cement barriers for dumping once it dries. Work has been performed as promised, but it would appear to be a bandaid on a gaping wound. Thank you Elk Grove News. Your 15 readers know the city monitors your website. I am sure EGN's original video caused city staff to take action and clean up some of the junk. This current video, along with another major safety issue, the EGN video of East Stockton Blvd. near Sheldon Road. Cones are there and part of the white bike lane paint is now gone. Better for cars, but what about cyclists? EGPD monitors Sheldon all the time because of the lower speed limit. That part of East Stockton should be part of their normal speed control monitoring. Drivers are still taking that curve way too fast.